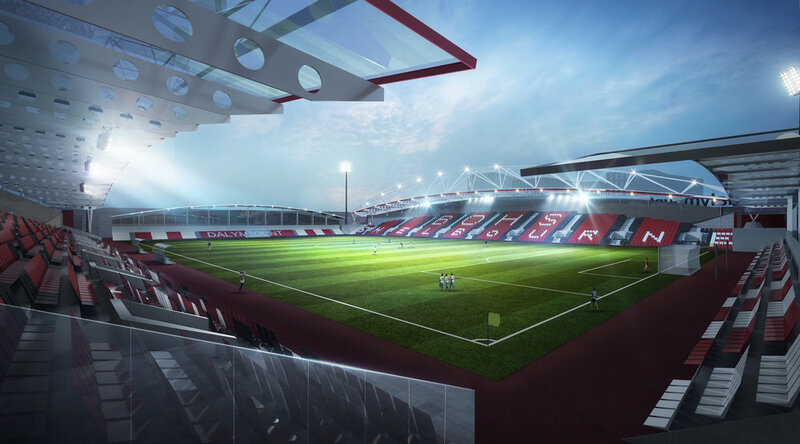 Holmes Miller are excited to release images of their design for a new 8,000 capacity stadium for West Cumbria in Workington. The stadium will become the new home for Workington AFC and Workington Town. Holmes Miller has been working for the last few months with the Council, both clubs and a design team that includes Gleeds and AECOM. Alan Smith, Leader of Allerdale Borough Council, said: "This development will put our town on the map and be something the whole of West Cumbria’s communities can be proud of." Some wonderful work on display at Holmes Miller Architectural Assistant Nada Shehab’s, and her colleague Alastair Kent, exhibition at the New Glasgow Society running till the 14th October. The entire event and exhibition titled Portraits of the City: Investigating the ‘Glasgow Style’ is sponsored by the GIA and the department at Strathclyde. As well as the designs produced with a contemporary Glasgow Style, Nada and Alastair have produced a series of images and drawings throughout their research of the city that has provoked discussion on what the Glasgow Style actually is! A beautiful mix of 49 pieces and a few models on shown. Holmes Miller has been working with Dublin City Council to produce design proposals for the historic Dalymount Park Stadium. Providing a new home for Bohemians FC and Shelbourne FC, the 6000 capacity venue will feature UEFA Category 3 facilities and a Community Hub for the district of Phibsborough. Concept video for Dalymount Park Stadium. Fantastic opening ceremony celebrating the new St John’s Primary School in Portobello for City of Edinburgh Council, delivered through their Consultant and Contractor Frameworks. The project team also took the opportunity to unveil the new football team strip, one of the local community benefits realised through the project. CIty of Edinburgh news item. The Edinburgh Reporter news item. With construction well underway, the striking sandstone facades and bay windows are now starting to appear along with the first glimpse of the dynamic penthouse roof profile. The first phase currently under construction, having sold out from plan a few months ago, is already transforming the Park area skyline, and Holmes Miller are delighted to see that demand still remains as high with over half of the overall 98 apartments now sold, and with penthouses now selling for over £1m. Congratulations to Holmes Miller Architectural Assistants Marina and Elina on the news that their Postgraduate work at University of Strathclyde has been recognised with the AJ Student Prize 2018. One juror said: ‘[The project] demonstrates the power of creative collaboration and offers a refreshing departure from the starchitect-manufacturing pedagogies that are inclined to over-emphasise the importance of individual portfolio projects. Studying the interwoven states of time, memory and space in the context of a territorial realm, Glasgow city becomes an urban canvas, where hidden narratives begin to unfold. Investigating the origins of a place, under a wider frame of reference, aids in understanding the city’s spatial, cultural, political and social development over the past centuries, as well as identifying prominent features or events that got buried under the rapid pace of urbanization. This thesis is an attempt to generate a precedent for a local cultural forum, that triggers the sense of cultural belonging. The city transforms into a palimpsest where citizens perceive present as a collective experience by unravelling the city’s shared pasts while simultaneously generating vision for the city’s future prospects. The exploration of all three states of time as interwoven realities, is expressed through a series of civic structures that seek to empower collective identity through the trading of ideas and public consolidation. Situated in the heart of Glasgow, Synchroni[city] is an attempt to give form to a cultural quarter for the public . Occupying the site where once the College Good Yard stood its typological orientation conveys a restored interpretation to the function of the market, transforming it from the trade of goods to the exchange of ideas. With its emergence it seeks to revive a version of the classical Agora, a public place of concentrated cultural activity and social encounter. The quarter is composed of three main structures, each one reflecting a temporal state of society – past, present and future – through the acts of recollection, reflection and public consolidation. The structure of remembrance, takes the form of an archive of the lost city, containing records of the city’s past that got lost as the city expanded. From physical elements (e.g. the Molendinar burn) to states of societal uprise (e.g. Red Clydeside, Suffragettes, trade and slavery) it restores the public memory of the city. The second object of study is a vessel of public reflection. The hall of hidden narratives rises as a mirror of the city’s terrain assembled in brick and exhibits the product of remembrance in tangible form. It is a symbol of materialization of expressive intuition in the form of public art. Proceeding to the final section the spatial sequence concludes with the peoples’ forum. It is a place for public deliberation taking the merged form of an auditorium and an arcade. A modern cathedral that enables social interaction through the stages of observation on the dialectics of present reality, debate and future contemplation. All the structures are connected through a central amphitheatre and signify the interwoven states of memory and social evolution. The synthesis itself was designed to form a precedent for a local quarter that would be situated in every county of Scotland, with the prospect of their interconnection, ensuing that social structure is established under a system that transcends from the citizen, to its local region, to the greater nation. Following the successful delivery of Glenpark Early Years Centre, we have been invited to present at the Education Estates Conference in Manchester on 16 October 2018. With increased commitment to provision of pre-school education and funded places for 3-5 year old children across the UK, local authorities are being challenged to develop flexible delivery models and create new facilities to meet this growing demand. Holmes Miller has developed a solution that brings all the benefits of off-site manufacture, to provide Councils with an ELC model that can be expanded to suit anticipated pupil rolls, and delivered efficiently, whilst aligning with challenging cost and area metrics. Referencing the recently completed Glenpark Early Years Centre, our Associate Director, Clara Garriga will discuss how these buildings can be crafted with innovation and creativity. Holmes Miller has submitted a planning application for a residential development at Kent Road on behalf of Kelvin Properties. The development offers 20 units for private sale on a tight urban site adjacent to Charing Cross. Ryan Holmes, Holmes Miller Associate Director, will be presenting at the Supply Chain Sustainability School Breakfast Briefing on Friday 7th September alongside Angeline Robertson, HubWS, and David Crawford, CCG OSM, to give a Client's perspective on Offsite Construction. The presentation will look at the development of a solution for the Early Years expansion programme that brings all the benefits of off-site manufacture, to provide Councils with a flexible solution that can be expanded to suit anticipated pupil rolls, and delivered efficiently, whilst aligning with expected cost metrics. This option can be customised to suit context, with a range of cladding solutions possible, and the large volume playrooms can be easily defined to marry with an early year’s curriculum. Holmes Miller are architects and Design Team leaders for the project to redevelop Meadowbank Sports Centre in Edinburgh. We are therefore delighted that The City of Edinburgh Council recently granted Planning Permission for this prestigious project. With the retention of the existing running track, the design celebrates the history of Meadowbank and the legacy of sporting achievement witnessed at events like the Commonwealth Games held in 1970 and 1986 as well as other many memorable moments in the history of Scottish Athletics. Holmes Miller has submitted a planning application on behalf of North Lanarkshire Council to extend the existing visitor centre at Drumpellier Country Park in Coatbridge. The centre is to be redeveloped as a gateway to the Seven Lochs Wetland Park, a new heritage and nature park spanning the Glasgow City and North Lanarkshire Council boundary between Easterhouse, Coatbridge and Stepps. The extension creates a new viewing area over Lochend Loch, with displays telling the story of the park and the Seven Lochs project. Construction work at the visitor centre is expected to start in the Autumn. Following a parliamentary debate earlier in the week, the Government will commission a fundamental review of standing at football matches in the English Premier League and Championship. All-seater stadiums have been mandatory in these leagues since 1994, after standing was banned by an amendment to the Football Spectators' Act 1989, following recommendations made in the Taylor Report into the Hillsborough disaster, which claimed the lives of 96 Liverpool fans. However, surveys of supporters have shown that there is support amongst fans for the introduction of standing areas and Sports minister Tracey Crouch says her "mind is open" on safe standing at football grounds after announcing a fresh review into the subject. The MP, speaking at Monday's parliamentary debate on the issue, expects findings of the initial research to be completed before the end of the year. In Scotland, The Scottish Premier League had previously made it a condition of membership that clubs had to have all-seated grounds. This requirement was relaxed in 2011. Following this, standing was re-introduced to the Scottish Premiership at Celtic Park, Glasgow. Holmes Miller and engineers Blyth & Blyth were instrumental in the design of the safe standing area at Celtic Park for Celtic Football Club which was completed for the start of the 2016/17 season. “The introduction of rail seating at Celtic Park represents an investment in spectator safety. Across football globally, the reality is that some supporters are choosing to stand at matches. "This is something we must accept and manage and also understand the positive effect which these areas have on atmosphere at matches. “Celtic’s primary objective will always be the safety and comfort of its supporters – this new system will now allow fans to stand safely at matches. Holmes Miller was delighted to share in the opening celebrations for the new Baldragon Academy, Dundee earlier today. Formally opened by Deputy First Minister and Cabinet Secretary for Education and Skills, Mr John Swinney, we were entertained during proceedings by the Academy's Vocal Group and Wind Band who were the star attraction for the day. Baldragon Academy is a 1100 pupil place community school, designed and delivered in close collaboration with Dundee City Council Capital Projects, Robertson Construction - Tayside, HUB East Central and Scottish Futures Trust. 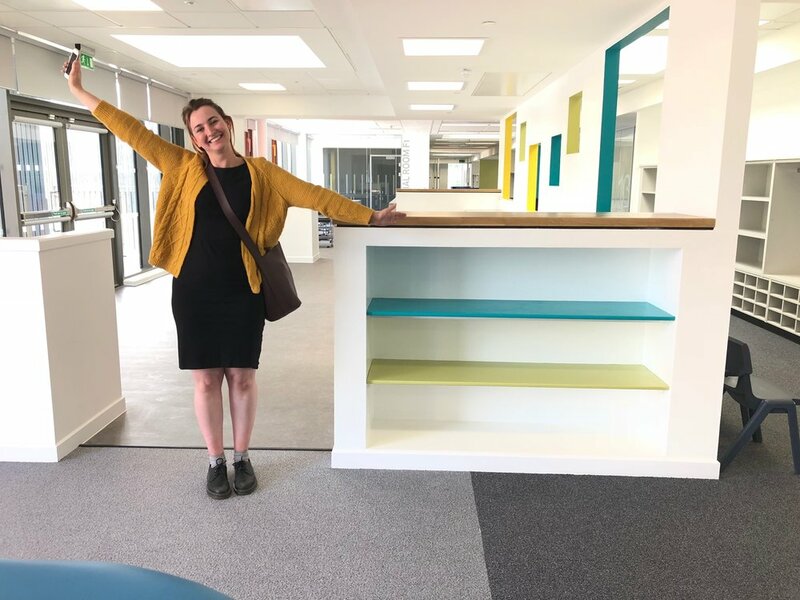 Holmes Miller's wish for the new school is that it can provide a platform, in whatever small way, whereby all users can fully fulfil their academic ambitions and personal development. On a personal note, can we share in wishing a long and prosperous retirement to the outgoing Head Teacher, Mr Kenny Hearn. We are excited to extend our collaboration with Renfrewshire Council and hub West Scotland on the regeneration of Paisley Town Hall. Holmes Miller has submitted a Planning Application on behalf of Vaga Developments Limited for the restoration and adaptation of the old Lenzie Primary School building on Kirkintilloch Road, providing 20 flats specifically designed to appeal to the downsizing market in the town. The existing building heights have been exploited to create two storey partial maisonettes over the two existing levels in the restored school, with the main living rooms retained as double height spaces. The existing double height atrium space with extensive rooflight is to be retained and restored to provide communal access to the renovated flats. A new extension provides nine additional flats, with full height glazing to all rooms, through a mix of French balustrades and balconies. The extension is to be finished in a mix of natural stone to the main frontage and facing brick to the side and rear elevations, with high quality composite windows throughout. Following fast in the footsteps of our flourishing Guangzhou (China) office opened in 2015, Holmes Miller was delighted to formally open our new office in Clerkenwell London on Wednesday 23rd of May 2018. Operating out of London since late 2017, following a merger with an established practice, Holmes Miller has utilised the intervening 6 months to consolidate the merger, standardise our systems and cultivate a pipeline of projects in London and the South West with new and existing clients. Sharing in the cultural and entertaining events happening during the ‘Clerkenwell Design Week’, the Practice utilised our new base in the heart of Clerkenwell to host a summer drinks reception with clients and consultants to formally open our new office. Whilst this is Holmes Miller's first formal London presence, we are no stranger to the city. Holmes Miller delivered the OCS Stand at The Kia Oval, we were Technical Advisor (TA) on the iconic new Wembley Stadium and we enjoyed unlimited access to the London 2012 Olympics Velodrome and Copper Box, unfortunately this was during their construction as Lead TA and not as a flag waving supporter. “The opening of a London office is the realisation of a planned strategy linked to our long held vision and ambitions for the Practice. I am delighted to have found a partner, through merger, who wished to share in the values and future of the Holmes Miller brand as we collectively strive to deliver excellence in design and service to our clients.